For centuries, the Chinese have treated health conditions with alfalfa; benefits from this vitamin rich plant have endured through the years and made it a valued herbal remedy used for a number of ailments even today. Alfalfa is under the plant classification of legume, although it is a green and leafy plant that is similar in appearance to clover. It is probably most associated as an ingredient cattle feed; primarily well as other grazing animals such as goats, sheep and horses. Human consumption of the alfalfa plant itself is often limited to the young plant. 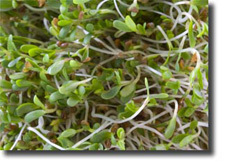 Sprouts of the plant are used in sandwiches; young, tender shoots are used in salads; seeds are eaten as snacks and tea is made from the alfalfa leaves. Because of the amazing mineral and vitamin content of the plant, however, alfalfa is now also a popular supplement in many diets. Long ago, alfalfa was used in treating a number of medical issues in Chinese culture, including kidney stones. It was also touted by the Arab nation as “Father of all Foods”; after noting that their horses seemed healthier when grazing on alfalfa, they included it in their own diets and realized they, too, increased their stamina and health by doing so. One of the reasons the plant has such value in vitamin and mineral count is because of its exceptionally deep root system; capable of retrieving those beneficial elements from well beneath the ground surface. Calcium, magnesium, potassium, iron and phosphorus are found in highly digestible form in alfalfa; benefits from these to the human health are very valuable since the body must have these to operate efficiently. Alfalfa is also very rich in vitamins; containing vitamins A, B6, B12, C, D, E and K, as well as many antioxidants such as carotenoids and phytonutrients. *Kidney issues: alfalfa relieves swelling and bloating; it also has the components necessary to dissolve kidney stones, which are vitamins A, C and E as well as zinc. Many other health benefits have been realized from taking alfalfa supplements, as well, including energy acceleration, muscle pain relief, urinary tract infections and even a hair growth remedy. There can be side effects to using this plant’s components, however. Just as with most anything in life, alfalfa should not be taken in excess. Too much of the herb has been noted to cause the breakdown of red blood cells in some individuals; a condition that can prove to be quite serious. Also, pregnant women and people with lupus should not take alfalfa in any form due to an amino acid found in the plant called canavanine. As with any dietary supplement, a doctor should always be consulted in order to determine if taking alfalfa fits with your own dietary requirements. It is only natural that a plant containing so many minerals, vitamins and essential elements should be beneficial to human health. As noted, it is strongly recommended to check with a medical professional before beginning to take alfalfa or any other herbal supplement. Its long lasting reputation from the early Chinese medical use to today’s herbal remedies prove that whether you decide upon alfalfa pills, leaves, seeds or powders, a health benefit can surely be realized from its use.